We’re now up on Amazon, and available for sale. Stay tuned for further updates on the Amazon site, including addition of the “Look Inside” featured text, plus a pending link to the Kindle version. 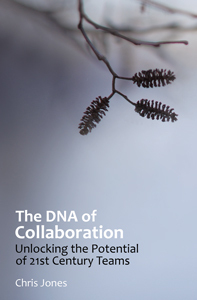 You can follow us here on the book’s blog site for more updates, on Twitter via @CollabDNA, or watch for the Amazon link: http://amzn.to/collabdna. We’re grateful for the positive feedback we’re getting, and for the many Kindle readers who have already started the conversation at hashtag #cdna. Looking forward to connecting and comparing notes ..
– Chris Jones and the Collaboration DNA team, 10/1/12. This entry was posted on Friday, September 21st, 2012 at 3:32 am	and tagged with #cdna, #CollabDNA, amazon, book launch and posted in amazon. You can follow any responses to this entry through the RSS 2.0 feed.